A Los Angeles-area Marriage and Family Therapist has released her step-by-step guide to decreasing anxiety, improving focus and productivity and honing mindfulness skills with simple and flexible exercises. In “Sitting Pretty: The Girlfriend’s Guide to a Mindful (and Joyful) Life,” author Laurie Goldey, MFT, puts forth a no-hassle, 52-week program for fostering and nurturing mindfulness skills that is designed to fit neatly into the hustle and bustle of work, family and friends while also teaching readers how to love their lives more fully. “Great essay and explanation of mindfulness. Modern view of contemporary, stressful, [sic] life,” an Amazon customer wrote in a five-star review of the book. 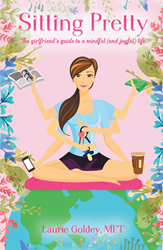 Whether handling a stressful project at work, aiding a child with schoolwork or enjoying a night out with friends, “Sitting Pretty” will equip readers with the necessary tools to help them feel less anxious, maintain a healthy balance between work and play and develop a more loving relationship with themselves and life’s simple joys. Laurie Goldey, MFT, is a licensed Marriage and Family Therapist and holds a master’s in psychology and counseling from California State University, Northridge. Goldey has been a student and practitioner of mindfulness in her own life, and she regularly shares her mindfulness practices with her husband and teenage son. She currently resides in Agoura Hills, Calif. To learn more, please visit http://www.sittingprettyguide.com.